The next generation of enterprise-grade stackable and standalone access-layer switches from Cisco has arrived with its Catalyst 3650 models. Give your network a strong foundation for complete convergence between wireless and wired networks on just one platform. The Cisco C3650 series use Cisco StackWise and Unified Access Data Plane for a foundation that supports most applications on an integrated circuit. Create single wired-wireless policy enforcement with top governance controls, as well as robust visibility for your applications, optimization, flexibility and high-quality resiliency. By offering used Cisco 3650 series switches, we help networks like yours expand with the latest technology. We’re supporting stackable options that can quickly extend beyond 48 ports. Use the categories below to find the right model for your Gigabyte requirements. Why Choose Used Cisco C3650 Series Switches? 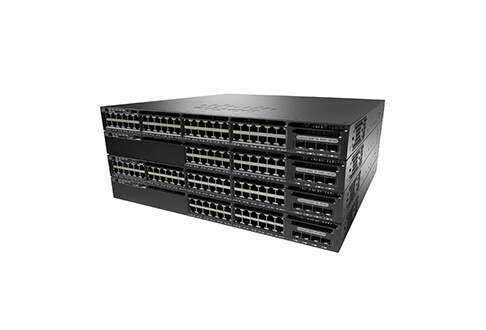 The Cisco Catalyst 3560 series switches are designed to operate as standalone and stackable units, supporting wired and wireless services on a single platform. The combined functionality from refurbished Cisco C3650 Switches ensures that your network is resilient and can maintain high availability through stateful switchover. Plus, you also get support for robust QoS, advanced security and Flexible NetFlow across both wired and wireless without interruption or disruption. Customers note that the combined wireless and wired functionality reduces software burdens, minimizes touchpoints for setup and maintenance, and can simplify overall network requirements. Give your team a lower barrier for management while also cutting the total cost of ownership for their management and utilization. A used Cisco C3650 switch is the smart addition for you to control infrastructure and have revenue available to upgrade sooner and more often. The line of used Cisco C3650 switches carried by Worldwide Supply includes multiple technologies and functionalities designed to improve your network. FNF support generates greater visibility while supporting wireless QoS and advanced security methodologies for both wired and wireless deployments. Mobility agent and controller modes come standard and allow you to better use resources, manage subdomains and provide better wireless connectivity with no additional license beyond the IP Base. Cisco C3650 units all come with StackWise-160 Technology support. This Cisco feature supports optional stacking with a bandwidth of up to 160 Gbps. The service uses Cisco IOS SSO to maintain resiliency and to have the entire stack act as a single switching unit. Management by a single active switch is simple and reliable. Worldwide Supply offers a full lifetime warranty on all of the pre-owned products we sell, including all used & refurbished Cisco C3650 switches. You get like-new quality that we ensure is up to OEM standards, through a robust review process conducted by our certified engineers. Your equipment will fall under our industry-leading warranty that can ensure quality while also providing you with quick replacement options and help whenever you need it. Plus, all used Cisco 3650 series switches we sell can be supported by our OEM-neutral maintenance program. These Catalyst units, both new and used, still support the full range of applications that come standard. You’re also getting access to unparalleled visibility, flexibility and resiliency. Each unit features a modular design. Your field teams can replace elements such as redundant fans and power supplies as needed, wherever you install them. Worldwide Supply can support your outfit with these installs, including getting you the components you need before there’s an emergency. Keep the total cost of ownership low and maintain network reliability with a smart maintenance and repair program. If you’re changing the deployment of your network, we can help you liquidate excess used Cisco C3650 switches. Don’t pay to store it for years and then eventually recycle it, costing you even more. Turn it into a new revenue opportunity by selling it directly to Worldwide Supply. We make top offers on used Cisco C3650 units so you can expand as you need. Cisco’s unified access switches are significant boosts to most networks. The UPOE support is in demand to support significant mobile device and application usage in today’s environments. The 3650 switches include unified access and an integrated wireless controller. Each supports up to 50 access points and 1,000 wireless clients on each switch. If you’re running with a used Cisco 3650 series switch but need more power, we have plenty of options available. You can also sell us your used Cisco switches. You get extra revenue when you need it to modernize and move to the most advanced options on the market. Reach out to us by calling 888.328.2266, or by clicking here to learn more about how we buy or sell refurbished C3650 series switches.